A Book A Week | Each week I'll write about a book I've read. According to award-winning writer and teacher Jory Sherman, “writing is magic.” But you don’t have to be a magician to decipher the fine points of writing. Sherman has been a mentor and literary consultant for more than 40 years. He has taught writing from up to the university level. His poetry and short stories have been published in literary journals and commercial publications. 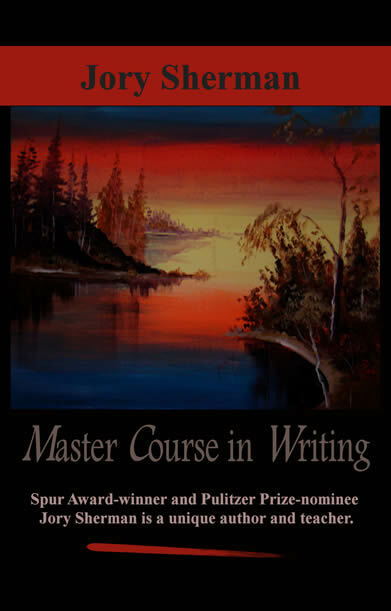 In the slim book, MASTER COURSE IN WRITING, Sherman shares some of his writing secrets, exercises, and examples. He begins with words of encoragement and discusses how to get started, keep going, and write to the finish. Let the words flow, no editing, no censorship. Danger of using flashbacks. Visit Sherman’s website to find out how to purchase a copy of his latest book. Special Note: Next week on Donna’s Book Pub I will interview Louella Turner, CEO and publisher of High Hill Press. If you leave a comment about Sherman’s book here or about my interview with Lou Turner on Donna’s Book Pub, your name will be entered to win a copy of Sherman’s book. The anthology is edited by Ellen Gray Massey. Contributors include: Velda Brotherton, Jory Sherman, Radine Trees Nehring, Betty Craker Henderson, Jane Hale, Carolyn Gray Thornton, Larry Woods, Bari Bumgarner, and several others. While I haven’t read all the stories in the anthology, the ones I’ve read have been great. How can you not be swept away with stories such as “The Mystery of Cedar Shade” by Jory Sherman, “The Missing Skull” by Velda Brotherton, or “Catfish Jack” by Roberta Vaughan Schwinke. If you’re looking for a collection of stories that capture the essence of the Ozarks region of southern Missouri and northern Arkansas, with its scenic hills where the Osage Indians once roamed, check out Mysteries of the Ozarks (Volume III). Today’s literary birthday: Shelby Foote, American novelist and Civil War historian, born November 17, 1916. FINDING JOY: ONE WOMAN’S JOURNEY BACK TO FAITH is an insightful and inspiring memoir that gives a personal glimpse into the life of Joy Wooderson, the daughter and granddaughter of Christian missionaries who lived and preached in South Africa. In FINDING JOY, Wooderson gives a unique perspective into her faith, her family, her African homeland, and her journey to the United States, where she became a U.S. citizen. The front cover, with the photo of white daisy seeking sunlight as it pokes through the parched brown earth, gives a hint of what awaits the reader inside. Chapter 1 opens with a quote from St. Augustine and begins with the author perched on top of Mount Sinai, marveling at the view and grandeur of the vista before her. Divided into nine parts and thirty chapters, Wooderson’s memoir reads like a novel, with the end of each chapter leaving me wanting to read more. The chapters and sections are peppered with Biblical passages from the Old and New Testaments, as well as other meaningful and contemplative quotes. The end of each chapter also contains what Wooderson calls “Pointers,” which are questions and statements that challenge readers to examine their own beliefs. The last page of each chapter also includes space for readers to record their reflections. Wooderson’s memoir is filled with candor and clarity. She openly discusses her crisis of faith, her doubts about organized religion, and the path she took to navigate through dark days into the light. Anyone who has struggled with their faith or questioned their belief system will find comfort, compassion and wisdom in FINDING JOY. October 29 – On this date in 1942 the Alaska highway was completed. THE LAST WILL OF MOIRA LEAHY is the debut novel by Therese Walsh, published by Shaye Areheart Books. Walsh is a gifted storyteller who has written a gripping story about the powerful bond of sisters and the unbearable sadness of losing a loved one. Raised on the coast of Maine, twin sisters Moira and Maeve, play pirates in their father’s boat. They are groomed to be uniquely different—one shy and demure, the other outgoing and bold—by their controlling mother. Moira is the piano-playing, awkward sister who grew up in Maeve’s shadow. Maeve, the extremely talented saxophone-playing, adventurous sister who is fun-loving and well liked. Though different in talent and tastes, the twins are connected by the strong bond of a shared secret language and an innate intuition. During the autumn of their sixteenth year, Moira steps out of Maeve’s shadows onto the main stage in an effort to become more daring–like her sister. Moira experiences her first love and gets wrapped in a web of lies and deception which led to a tragic end. Years later Maeve is doing her best to cope after the loss of Moira. Estranged from her mother, who blames Maeve for Moira’s accident, Maeve pushes intimacy and music away and cocoons herself in her work. She skims the surface of life until one night at an auction she bids on a keris, a Javanese dagger that reminds her of the joyful days she shared with Moira. Her acquisition of the keris sets in motion a series of events that propel her to seek the truth and open herself from the numbness of her life to seek adventure, love, and face he secrets of her past. It was my good fortunate to receive two copies of Walsh’s debut novel as part of the WOW! Blog tour. I received one copy to review, and one to use as a giveaway on Donna’s Book Pub, my other blog. Beginning tomorrow, through next Wednesday, stop by Donna’s Book Pub to read an interview with Therese. Anyone who leaves a question or comment for Therese on my blog is eligible to win the giveaway copy, which will be announced on November 4 (the birthday of my twin grand-nephews). On October 20, 1925, U.S. journalist and humorist Art Buchwald was born. Okay, I’m a day early mentioning a celebrity writer’s birthday, but tomorrow is also my grandson’s Michael’s birthday–so why not? I recently read a thriller called THE HIDDEN MAN, written by David Ellis and published by G.P. Putnam’s Sons. What makes this book so intriguing and noteworthy is not only the vivid writing, compelling characters, and strong story line, but also the author himself. Ellis is not only a writer, but he was the lead prosecutor in the trial of former Illinois governor Rod Blagojevich. Ellis uses his first-hand knowledge of the criminal defense system to write THE HIDDEN MAN, a thoughtful and surprising thriller that ponders the larger questions of fate, loyalty, redemption and having the courage to do the right thing, in spite of the risks and regardless of the consequences. The main character is Midwesterner Jason Kolarich, who rises from humble beginnings to become a star in a high-powered criminal defense firm. Although Jason has escaped his neighborhood and unfortunate family situation, he has never forgotten his roots. After his wife and daughter die in a freak car accident while Jason is working late, he blames himself and walks away from his celebrity for a simpler life. While trying to cope with his unimaginable grief, he is hired by a mysterious “Mr. Smith” to defend a childhood friend from a murder charge. In doing so, Jason must relive a tragic incident that has haunted him for decades. I can’t believe it’s been a month since I’ve posted a book review. Where did the month of September go? With the changing month and now that the leaves are changing and adding color to the scenery, I thought it would be appropriate to post about a book that discusses dealing with life-changing events–without fear. FEARLESS: Imagine Your Life Without Fear, published by Thomas Nelson Publishing and written by New York Times best-selling author Max Lucado, is an uplifting and inspirational book that offers promise and hope to live without fear. Chapter-by-chapter, using quotes from Scripture, the life of Jesus Christ, and examples from the famous and obsure, Lucado guides readers on a journey to understand and overcome fear. The Discussion Guide in the back of FEARLESS is a welcome resourse. The guide can be used by groups or individuals. It is divided by chapters and contains three-part lessons for each chapter on: Examining Fear, Exposing Fear, and Battling Fear. Each lesson includes recommended readings from Scripture. FEARLESS is a spiritually uplifting book to read and use as a study guide to live a life of faith–without fear. It’s a keeper. On this day in 1875, Edgar Rice Burroughs, creator of the popular character Tarzan, was born in Chicago, Illinois. Writer Mama: How to Raise a Writing Career Alongside Your Kids, by Christina Katz, is the book I’ve chosen to review this week. Katz also has a fantastic Writer Mama blog. During in the month of September she is giving away a book each day. So, pop on over and sign up. Katz’s book is chock-full of writing advice and encouragement for writing moms–and grandmoms like me. In the Pep Talk section, Katz lists 10 reasons for mamas to launch their writing career. The one that appeals to me is #5: “Mamas who write set a good example for their kids.” I’m sure this applies to Grandmas as well! Preparation covers the tools and attributes writers mama need. Practice shows how to build basic writing skills to compete with professionals. Professionalism covers querys and interviews and includes a glossary of query terms. Poise offers suggestions for developing skills to get your name known and how to pitch. A Book A Week · Each week I'll write about a book I've read.